11 members of Bracknell Ice Skating club traveled to Sheffield on Sept 27th for the British Adult Championships. 3 came to give much appreciated support , 8 skated in various Free and Dance competitions and 4 came home with medals so it was a good weekend for Bracknell. The competition was held on Sunday 28th. It was a long day for some as after getting up at 5.15 am for practice ice, the competitions were spread throughout the day with the dancers being on the ice at 8.45 am for Compulsories and then not til 3.40 pm for the Original Dance section. With a long wait for results and presentations not held til after 8pm it was not easy to face the 3 and a half hour drive home! We all made it safely and all agreed it was a great weekend. Our Free skaters - who have only level 1 or 2, all competed in the level 4 and under classes which were split by age. Rachel Jarvis did exceptionally well in her class getting the silver medal with Lesley Brenikov coming 7th in the same class. Val Toeman got a bronze medal in her class and Nicki Torrington skated well in a strong class but just missed out on a medal coming 4th. Our dancers all competed in the level 4 and under dance class, in the same age group, though again 3 of them have only level 2 and 1 has level 3. This year the competition had both a compulsory dance section (worth 40% of overall mark) and original dance section (60% of overall mark). After the compulsories Carol Stedham and Viv Coene were in joint first place with Susan White of Basingstoke. However a great skate in the Original Dance (a march) by Gail Tudor saw her win this section to pull her up to third overall overtaking Viv. Unfortunately a mix-up at the presentation meant Carol had to come home without her cup for first place but this will be sent to her and she got a bottle of wine by way of an apology! We were all very impressed by the facilities at Ice Sheffield (especially the comfy sofas and great food in the bar area overlooking the ice pads, the cheap ice prices and friendly staff) and despite the long drive would all definitely like to skate there again. 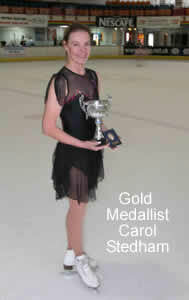 Thanks to Pat Watson, Eleanor Jarvis and Jen Truby for coming along to support all the skaters. 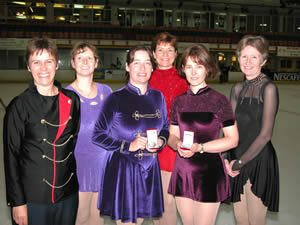 Medal winners Gail Tudor and Rachel Jarvis (centre front) with (L-R) Sue Truby, Nicki Torrington, Lesley Brenikov, Viv Coene.